The Opus Dispenser makes liquid dispensing easy, intuitive, and fast, while maintaining accuracy and precision. The advanced functionality of stepper and serial dispensing makes the Opus motorized bottletop dispenser an innovative tool to improve throughput and efficiency in the lab. Furthermore, the TFT touchscreen extends that functionality by making it easy to program, easy to operate, and allows users to share the unit without interfering in each other’s work. Superior construction and media recirculation make the Opus Dispenser a smart purchase for long-lasting quality and efficiency in operation and reagent usage. Awards Earned by the Hirschmann Opus Dispenser! The Hirschmann Opus Bottletop Dispenser comes standard equipped with a Thin Film Transistor touchscreen. The TFT touchscreen allows users to easily operate the motorized bottletop dispenser with a soft, sensitive touch. Furthermore, the touchscreen is paired with an intuitive, clearly labeled navigation menu. 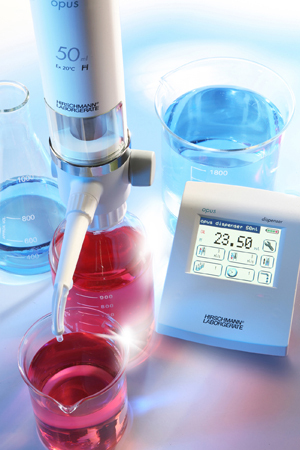 Dispensing is configured via the touchscreen external control module and controls everything from volume configuration to individual calibration. Serial Dispensing – Users can program the Opus motorized bottletop dispenser to dispense the same volume up to 9999 times. 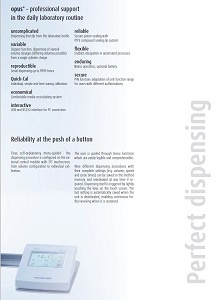 Programming of dispense volume and dispensing action are performed via the touchscreen console. Stepper Dispensing – Users can program the Opus Dispenser to dispense several instances, of varying volumes, with only a single cylinder charge. Slow/fast Dispensing – Users can program the Opus motorized bottletop dispenser to dispense more slowly if needed for work with viscous media. 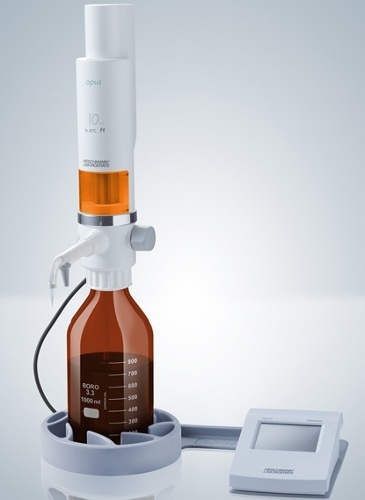 The Opus Dispenser is capable of 0.01 mL/s up to 2 mL/s dispensing or aspirating. Opus motorized bottletop dispensers will automatically save the last setting that was used when the unit was deactivated, thus users can continue working as soon as it is restarted. Opus units are equipped with a 9-slot memory, so users can store up to 9 programmed procedures. The Opus Dispenser is equipped with the capability to hold multiple user settings. User configurations are locked via PIN system so that users can ensure their configurations are protected from changes. Opus motorized bottletop dispensers include a light protection window for the valve block. If needed when dispensing a light-sensitive media, users can simple change out the valve block window with the light protection window. Designed for the busy lab, Opus Dispensers can rotate freely on the bottle. Thus users can always have the bottle label pointing towards them but still have the bottle top dispenser pointed wherever necessary. Hirschmann equipped the Opus Dispenser with a Universal Luer connector. Users can connect dry tubes, filters, and similar parts directly to the dispenser using the Luer connection. Opus motorized bottletop dispensers are equipped with a media recirculation system that applies simple and rapid venting to facilitate rapid aeration without loss of reagent. Hirschmann developed the Opus Dispenser with outstanding materials, reliable piston sealing, and a durable construction to deal with even problematic media. Discharge valves and valve seats are made of high-purity aluminium oxide ceramic. Valve springs are procured from Hatelloy. USB and RS232 interface for direct PC connection. 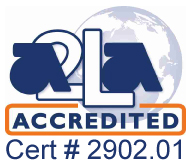 Opus can be actuated, and all data read directly on the PC, via the serial connection (RS232/USB) - aiding direct further processing and documentation.